Trego provided an oil painting in tones of black and white knowing that it would be used as the basis for an engraving. There is at least one other example of his having done this. This work was created for the Century Publishing Company to be used as an illustration in their publications. 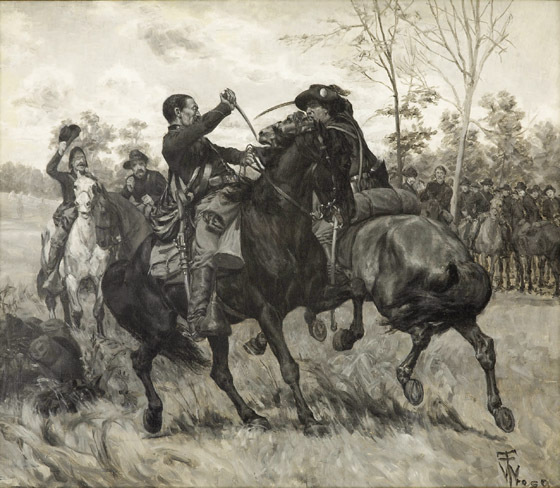 An engraving by J. W. Evans based on Trego’s painting was used with a magazine article and was published as A Duel Between a Union Cavalryman and a Confederate Trooper in volume 2 of Battles and Leaders of the Civil War in 1887. Century also published the image separately as a print. In addition to the publication of the image by Century Publishing Company in the nineteenth century, prints based on this image are still available today. The image was published in Fairfax Davis Downey, Clash of Cavalry; The Battle of Brandy Station, (New York: David McKay, 1959). He incorrectly gives the artist’s name as W. E. Trego. The painting was offered at auction by Heritage Auction Galleries of Dallas in June 2008 and at that time was seen to be in very good condition.